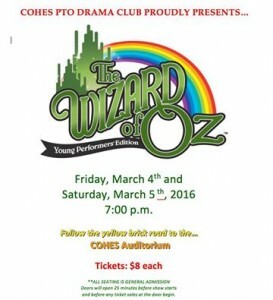 Congratulations to the cast and crew of the Wizard of Oz! Wonderful job by all involved. This entry was posted in Event on March 10, 2016 by COHES PTO. Here’s the info for the COH Elementary production of The Wizard of OZ. The kids have worked very hard and are doing an amazing job! Shows are tonight March 4 and tomorrow night, March 5 at 7 pm. Tickets CAN be purchased at the door. Advance ticket holders will be let in at 6:35 and then sales will begin at the door. Show starts at 7 pm! This entry was posted in Event on March 4, 2016 by COHES PTO. In the event of rain, we will meet in the cafeteria.. The COH PTO will have spirit items available for sale. This entry was posted in Event on July 28, 2015 by COHES PTO.